Tomorrow the UK will be celebrating World Book Day and we’re ready! 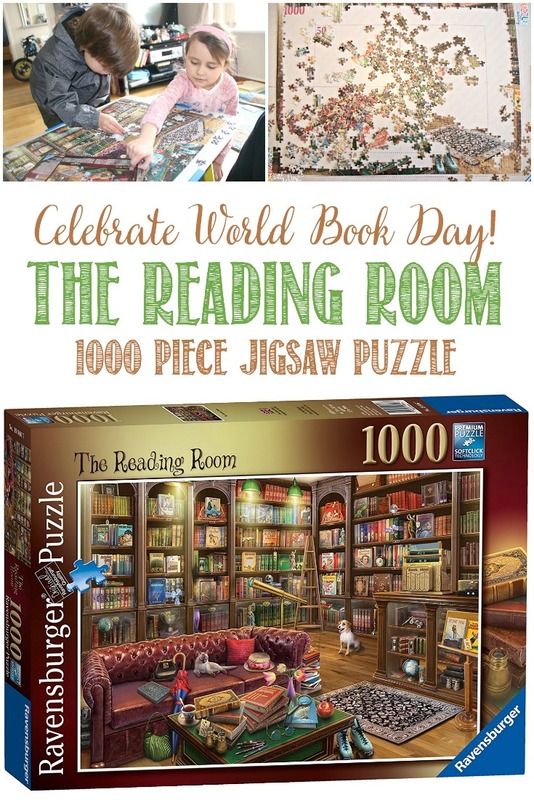 Not only do we have a stack of books ready to read today, we have are also working on a fun puzzle called, The Reading Room in honour of our favourite hobby; reading. 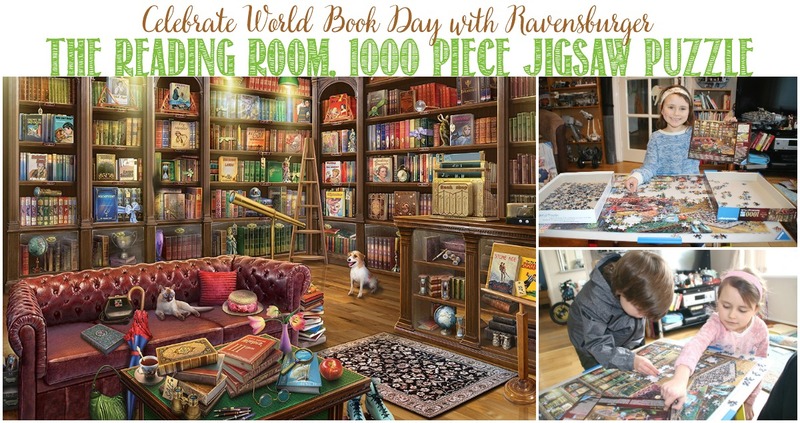 Ravensburger is in the mood for World Book Day and kindly sent us a puzzle to celebrate! 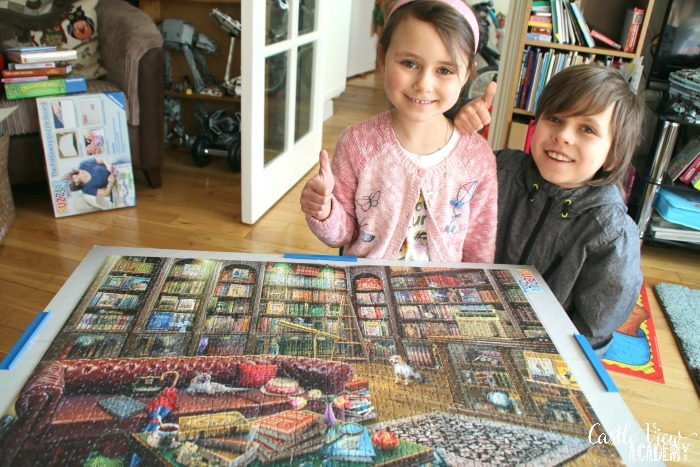 The Reading Room is a 1000 piece puzzle by Eduard, a talented Ukrainian graphics designer. This reading room appears to be a cozy bookshop, complete with an old-fashioned till and and resident pets. I have always wanted my own reading room, or at least space for my own library of books, and Tristan also dreams of the same thing. A cozy nook with a comfortable place to curl up with a good book and lose all track of time. Reading is my favourite thing to do, but these days I don’t have much time to relax in peace and read without interruption. 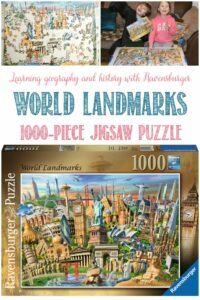 However, puzzles are easier to do when time is short; you can simply set things up and do a piece here and there as time allows. You don’t need to worry about losing your place or forgetting the plot or characters. 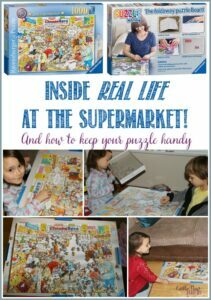 With a puzzle (and Puzzle Handy), you can simply slide your puzzle under the sofa when you need to concentrate on real life. 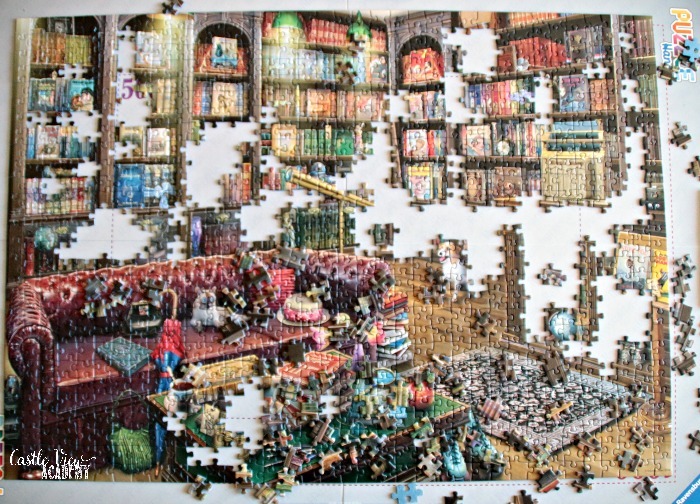 Of course, the first thing we always do with a puzzle is separate the frame from the centre pieces. This was just the job I needed after a cold afternoon walk around a nature festival. I was cold and tired and didn’t want to do anything that required too much hand dexterity. Typing was out of the question. 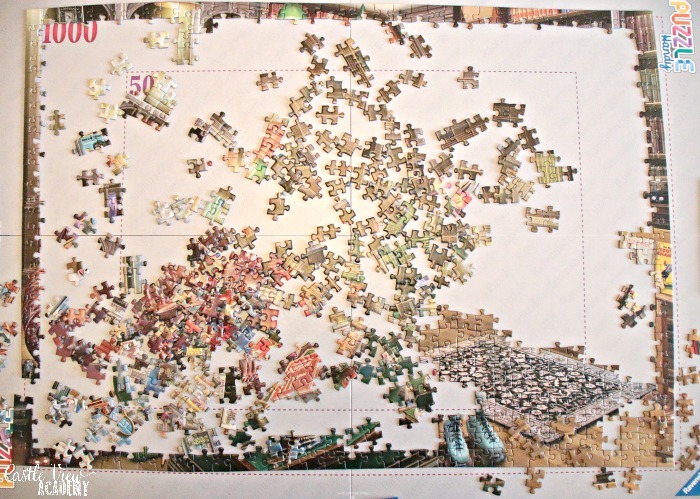 Then I worked on starting the centre of the puzzle while Phil was making dinner for date night with a movie. Sunday I had some work I needed to do for my virtual assistant job. But I can only sit and look at a laptop screen for so long. After a couple of hours I needed to take a break so I headed over to our Reading Room (front room) where the rest of the family was congregated. Phil was helping the kids with a Fibronicci math equation and while they looked for patterns in math and snails, I looked for patterns in the puzzle books. There are patches of colour: red, burgundy, greens, blues, oak, and yellow. There were some patterns as well; a flowered rug, a buttoned sofa, striped bookcase pillars, and of course the spines of the books on the shelves. I started off first with the rug, then moved onto the roller skates, the coffee table, and some of the book covers. Putting them into the rough place where they would eventually end up so I could work around them. All too soon it was back to the regular weekday routine after the children helped me finish off the last of the puzzle. 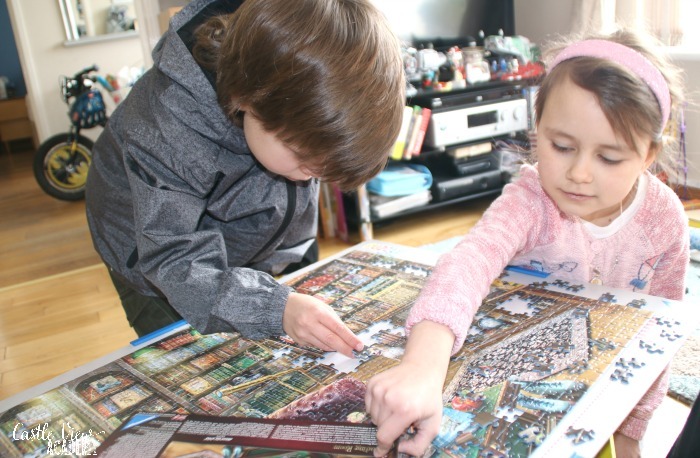 Who can blame them: working on a puzzle is much more interesting than writing conjunctive clauses or doing long division! 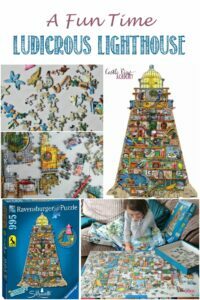 We’ve really enjoyed putting this puzzle together, and as always time spent with it passes all too quickly (I may have accidentally stayed up until 1:45am on Sunday night instead of 11:00pm – it only felt like a half an hour)! Now it’s time to work our way through the stacks and back to reality. The Reading Room 1000pc Jigsaw Puzzle is available through fine retail stores and Amazon.co.uk. Oh this is great! My 2 daughters will love doing this with me. It was a lot of fun, enjoy!